Grand Teton National Park is one of the major draws to a trip to Wyoming and the Jackson Hole area. Besides stunning scenery, there are so many outstanding activities and attractions-more so than most guests have time for! 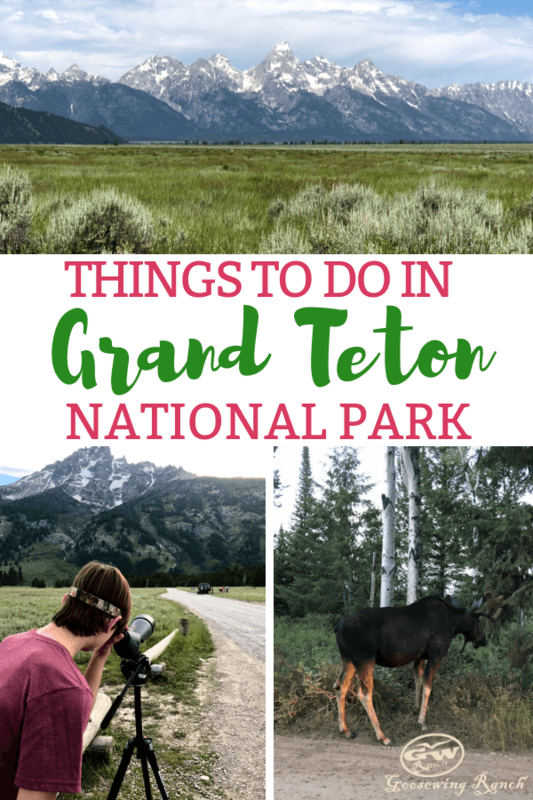 We break down the massive list of things to do in Grand Teton National Park along with some tips and basics to know before you go. Grab your binoculars and set your sights on a Grand Teton National Park trip! With a little bit of planning and an open mind to exploring, Jackson Hole and the Grand Tetons will potentially be the best vacation ever. 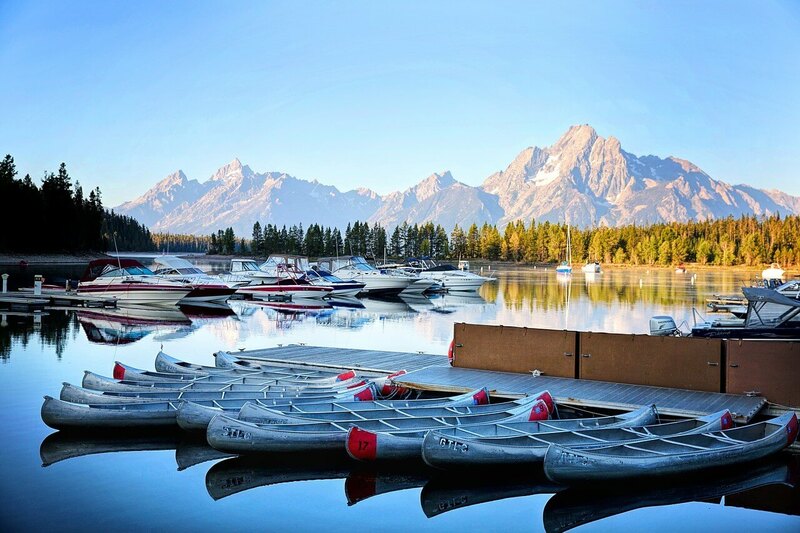 Get ready with our suggestions of things to do in Grand Teton National Park. This is the best way to cover a lot of ground or if pushed for time. The 42 Mile Scenic Loop: This is a loop, so start wherever is convenient for you. Our recommendation is to start in Moose and travel north along US-89 to Jackson Lake and return to Moose via the Teton Park Road. Jenny Lake Scenic Drive: Follows the east shore of Jenny Lake and provides spectacular views of the peaks. Signal Mountain Summit Road: Signal Mountain is the only mountain to be climbed by car. 5 miles to Signal Mountain’s 7,720-foot summit, from which you have 360-degree views of the valley below. Most of the major companies offering scenic floats glide down 10 miles of the Snake River. 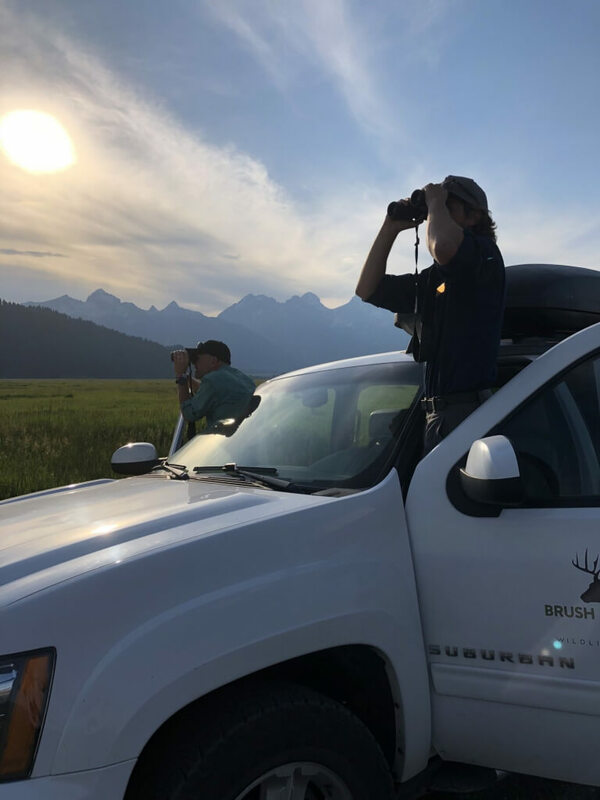 All the while, guests are soaking in all the majestic views of the Tetons and wildlife at close range. With an average round trip time of 2.5 – 3 hours, these trips are an ideal length, long enough to be considered a full river adventure yet short enough to allow other Jackson Hole activities the same day. Lakes and hike are two of the main draws for Jenny Lake. Most noteworthy hikes include Hidden Falls Trail including Inspiration Point, a moderate 4.9 mile loop trail; String Lake Loop-easy at 3.9 miles; and Paintbrush Canyon, 16 miles categorized as strenuous. Interesting Fact: Jenny Lake formed during the ice age when glaciers flowed down canyons and carved out depressions on the valley floor. Today, water fills these depressions forming lakes. Jenny Lake is over 250 feet deep! They don’t call it the great outdoors for nothing! Grand Teton National Park has so many activities to be enjoyed outdoors, there may not be enough days in the vacation. Wildlife safaris are incredibly popular as a combination of education and wildlife sightseeing. There are multiple touring companies offering a wide range of excursions that teach visitors about the wildlife, geology, and natural history of the park. Book in advance because they will fill up fast. While we love for guests to do their horseback riding with us, we can say that it’s an awesome activity no matter where you experience it. For inside the park rides, there are 1 and 2 hour horseback rides departing from Jackson Lake Lodge and Colter Bay Village, and 1 hour rides from Headwaters Lodge. While on the rides, wranglers share insight into the area’s history, wildlife and flora. Horseback riding at Jenny Lake Lodge is available to guests staying at the Lodge. Commercial companies offering rides in the park include: Headwaters Lodge at Flagg Ranch, Grand Teton Lodge Company, and Lost Creek Ranch. The National Park Service has a great guide on all the hiking trails in the park. Be Bear Aware: If planning on hiking, we recommend purchasing bear spray. Also it is vital to carry drinking water. Dehydration is common and can be serious. Most visitors will need to drink considerably more here due to low humidity and high elevation. From canoes to kayaks and motorized boats are plentiful in the park. Just be wise which lakes allow which types of vessels. On Jenny Lake, you can rent a canoe or kayak or launch your own boat (less than 10 horsepower) to enjoy the lake at your own pace. A boat permit is required. Sailboats and wind-surfers are not allowed on Jenny Lake, but may be used on Jackson Lake. Fishing fans might be angling to try some fishing inside the park. As such, purchase a Wyoming fishing license at marinas and tackle shops. Join a ranger for a scheduled program to learn about the wild communities, history and geology of the park. Craig Thomas Discovery & Visitor Center (open March to October)-Located in Moose 12 miles north of Jackson. Colter Bay Visitor Center (open mid-May to October)-Located 25 miles north of Moose, adjacent to Jackson Lake. Flagg Ranch Information Station (open June to early September)-Located 16 miles north of Colter Bay on Highway 89/191/287. Jenny Lake Visitor Center (open May to September)-Located 8 miles north of Moose at South Jenny Lake. Laurance S. Rockefeller Preserve Center (open June to September)-Located four miles south of Moose on the Moose-Wilson Road. DO NOT approach wild animals. Whether in a car or on foot, stay at least 100 yards away from bears and wolves and 25 yards away from other wildlife. Use binoculars, spotting scopes or long lenses for close views and photographs. Never position yourself between an adult and its offspring. Females with young are especially defensive. It is illegal to feed wildlife, including ground squirrels and birds. Feeding wild animals makes them dependent on people, and animals often bite the hand that feeds them. Do not harass wildlife. Harassment is any human action that causes unusual behavior, or a change of behavior, in an animal. Repeated encounters with people can have negative, long-term impacts on wildlife, including increased levels of stress and the avoidance of essential feeding areas. Nesting birds are easily disturbed. For wildlife, raising young is a private affair. If an adult bird on a nest flies off at your approach, or circles you or screams in alarm, you are too close to the nest. Unattended nestlings readily succumb to predation and exposure to heat, cold, and wet weather. Allow other visitors a chance to enjoy wildlife. If your actions cause an animal to flee, you have deprived other visitors of a viewing opportunity. Use an animal’s behavior as a guide to your actions. Don’t miss Oxbow Bend, possibly the most iconic Grand Teton National Park sight and also the most photographed. The appeal? Capturing Snake River as it approaches the Teton Range with Mount Moran reflected in the water. Located just a little over a mile straight east of the Jackson Lake Junction on Highway 89, this spot will jump out because of its beauty and also the crowds! Schwabacher’s Landing is a launch site on the Snake River for anglers and river rafters and is one of America’s most spectacular viewpoints. From Jackson, WY – travel north on Highway 191 for 16 miles and then turn left onto Schwabacher’s Landing Road. This area gets it name because Mormon settlers once established 27 homesteads here. It’s a photographer’s dream; two historic barns are the backdrop to some of the most iconic landscape shots in the US. Driving north on highway 191, turn right onto Antelope Flats road just past Moose Junction. In a little over a mile, turn left at a small dirt road. Parking area provides access to the John Moulton barn, and turning right goes to the T.A. Moulton barn.